This eight-week series will help all teenagers—new and longtime Christians alike—think about important aspects of the faith journey. They’ll have opportunities to ask questions, explore the Bible, and grow their relationship with Jesus. Deciding to follow Jesus is cause for massive celebration—both on earth and in heaven. The phrase “life-changing” definitely applies. Although this kind of commitment brings an initial rush of excitement, the freshness of a newfound faith can dissipate, leaving students unsure about what comes next. Don’t forget to check out the student book behind the lesson series, The Essential Guide to My New Life With Jesus by Scott Rubin. It makes for a great component to this line of curriculum! Bulk pricing available. Eight Lessons: Engaging, adaptable lessons. 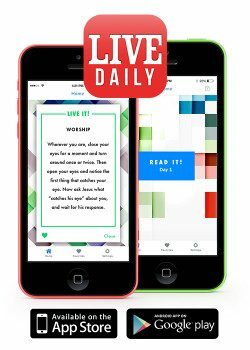 Plus, LIVE™ My New Life With Jesus includes access to the innovative new LIVE Daily app that sends teenagers “in the moment” prompts and ideas for living out their faith. Each day’s idea taps into different ways that people learn — through serving others, reading Scripture, tackling questions, looking toward Jesus, and worshipping in ways beyond singing songs. LIVE My New Life with Jesus includes access to the innovative new LIVE Daily app that sends “in the moment” prompts and ideas for living out their faith. Each day’s idea taps into different ways that people learn—through serving others, reading Scripture, tackling questions, looking toward Jesus, and worshipping in ways beyond singing songs.